Fiasco at Tripoli city hall as guards find grenade in MP's handbag; underscores sense of insecurity, turmoil in post-revolution Libya. A Libyan member of parliament who was caught with a hand grenade in her handbag said she carried it "for self-defense". Souad Soltan was caught with the grenade as she put her bag through a metal detector at the entrance of the city hall in Libya's capital Tripoli, according to the local authorities. "When the security officer asked her what was in the bag, she admitted there was a grenade that she carried for her own defense," continued the statement, translated from the local government's Facebook page, according to AFP. The grenade was confiscated and Soltan was allowed to enter the building to attend the meeting - but upon her departure, she demanded it back. "After she left the meeting, she wanted the grenade back but the security officer refused," the statement added, denying reports that she had been arrested. Whilst a hand grenade might seem like a somewhat bizarre choice of weapon for "self defense", the fiasco underscores the sense of insecurity and lawlessness which the North African country has faced since the ouster of its long-time dictator Colonel Muammar Qaddafi. Recently, Tripoli has seen a particularly ferocious wave of violence as rival militias battle it out for control of parts of the city, exposing the weakness of the country's central government and the power still wielded by independent militias who previously fought alongside each other to depose Colonel Qaddafi. The most recent clashes came after members of the Misrata militia stationed in Tripoli fired on protesters demanding their departure, killing at least 48 people and wounding more than 500. 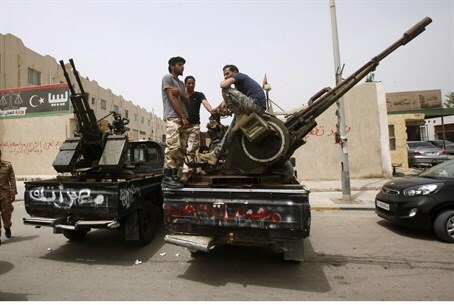 Following the violence the Libyan army moved in to the capital, setting roadblocks and manning patrols in a bid to crack down on the militias. Reports say they were warmly welcomed by residents fed up with the continuous clashes, which at times has involved heavy weapons including anti-aircraft guns. Last month, the country's Prime Minister was briefly kidnapped by an Islamist militia "in protest" of the capture by US forces of a senior Al Qaeda operative in the country. Prime Minister Ali Zeidan was released unharmed shortly afterwards.